Dear Dr. Milan – A sincere “hug of appreciation” is being sent your way from Phoenix, Arizona – from our school; Hearn Academy! We are so grateful for the story of Meg and Telling The Truth. It has helped us with HONESTY and being truthful with others, at our school and in our homes. We especially liked the colorful story, the motions we did to explain our values & feelings and the visit of Megs friend LIA – Love In Action! Thank you so much for a great assembly, and the gracious donation of books for our newly renovated school library. We hope to hear more about the Adventures of Meg very soon! I am a parent of two children from Brooklands Elementary. I am writing because during my conversation with the them upon returning from school one day they mentioned that an author visited their school and spoke about the five human values to their class. They are both familiar with the values and totally loved that you presented it to them! I would first like to thank you for the opportunity you have given both the staff and the students at Henderson Middle School. Your presentation on Human Values was phenomenal. Being that we are a Title 1 school; and located in one of the poorest neighborhoods in the USA, the topic of human and core values is not a subject that our students hear enough of unfortunately. This is why your presentations are of the utmost importance at our campus and our district overall. My belief and hope is that our students will always remember your message, and they will carry it through their high school and adult years. This is turn gives them an incentive to become successful and contributing community members. We look forward to having you back in El Paso, and becoming a part of our collaborative learning community. 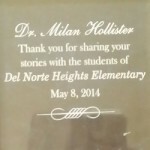 Del Norte Heights had the great honor of having Dr. Milan visit our school in May 2014. The teachers, students and parents were delighted to have her spend the day reading, sharing and talking with them. Everyone loved her presentations and had nothing but positive things to say about Dr. Milan. 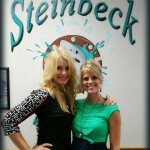 She brought the stage to life for our students and she was able to spend time explaining her values program with us. It is always a thrill when a children’s book author comes to visit our campus because it makes reading come to life for our students. She came on Book Fair day and was kind enough to stay and sign books for students and their parents. Her visit here at Del Norte was meaningful and exciting to everyone. I would recommend her to other schools to conduct presentations to their students. She came as a guest and left as a new friend! We look forward to having her return in the future.